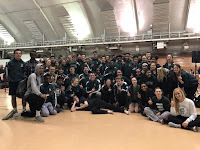 The boys JMM Track & Field team kicked off their season by competing against a 15 team field at the University of Dubuque on Saturday morning. The team finished in 3rd place in the varsity competition with 56 points and also a 3rd place in the jv competition with 41 points. The boys were led by returning two-event state champion Daurice F who posted 1st place finishes in the 55m hurdles (7.56) and long jump (22' 1.5"). He was joined by senior Micah P in scoring in both events taking 7th in the hurdles with a 8.89 and earning a 2nd place in the long jump with a leap of 20' 6". The best showing by a newcomer goes to freshman Hunter P who cleared 5' 10" in the high jump earning him 8 team points and a 2nd place finish. Zach O earned a 4th place finish in the pole vault matching his PR of 9' 0" and Ryan B also placed 4th in the shot put with a PR of 44' 2.75". Sophomores Jake A (6.88) and Jason W (6.91) both made the 55m dash final and finished 7th and 8th respectively in a competitive final. Bryce H ran to a 6th place finish in the 3200 meter run with a time of 10:26.69. Eligh A leaped 19' 0" for a PR and a 6th place finish in the long jump. Additionally, the varsity 4x200 relay placed 7th in 1:38.32 and the 4x800 relay was also 7th 9:08.85. In the jv competition the senior trio of Raquan C (7.12), Quincy M (7.18), and Trevis M (7.20) went 4th, 6th, & 7th respectively in the 55m dash. Freshman Jonas B placed 7th in the 1600m run with a time of 5:13.45. Sophomore John A had an over five foot PR in the shot put to take 2nd place with a heave of 35' 5". Senior Anthony H (18' 4") and sophomore Alex B (17' 4") went 3rd & 6th in the long jump. Rounding out the scoring for the jv competitors was the 4x800 relay placing 2nd (9:43.06), the 4x200 relay placing 6th (1:44.73), and the 2/2/4/8 medley relay placing 8th (4:27.59). This meet provided a great opportunity to knock of some rust from a long winter layover. Today provided a great starting point to build off for a successful season. We look to head back to practice on Monday and join our teammates in making improvements in every aspect of our competition. Take advantage of every day to improve from here until the end of the season.